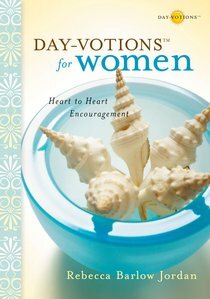 Women will find help and strength for every circumstance in these 40 inspiring devotions from bestselling devotional author Rebecca Barlow Jordan. Let Jordan's words draw you closer to God as she shares warm, personal stories, biblical truths, and prayers that invite you to apply what you learn and walk more closely with the Lord. - Publisher Introducing a new series of Day-Votions from bestselling inspirational author Rebecca Barlow Jordan. This beautiful, lighthearted series of devotional books is perfect for you and is a perfect gift for women of all seasons, and all stages of life. From deepening your walk with the Lord to strengthening your relationships with others ... mothers, daughters, grandmothers, and women everywhere will find page after page of powerful spiritual encouragement within. Each 'day-votion' points to a biblical truth, affirming with every reading that God is faithful no matter what challenges you face. With forty devotions per book in this three-set series---Day-Votions for Grandmothers, Day-Votions for Mothers, and Day-Votions for Women---designed to bring you into deeper relationships with God, your family, your children, and your friends ... inspiration is certain. Introducing a new series of Day-Votions from bestselling inspirational author Rebecca Barlow Jordan. This beautiful, lighthearted series of devotional books is perfect for you and is a perfect gift for women of all seasons, and all stages of life. From deepening your walk with the Lord to strengthening your relationships with others ... mothers, daughters, grandmothers, and women everywhere will find page after page of powerful spiritual encouragement within. Each 'day-votion' points to a biblical truth, affirming with every reading that God is faithful no matter what challenges you face. With forty devotions per book in this three-set series---Day-Votions for Grandmothers, Day-Votions for Mothers, and Day-Votions for Women---designed to bring you into deeper relationships with God, your family, your children, and your friends ... inspiration is certain.